Israeli born dancer and choreographer Dana Ruttenberg presents "Naba 2.0." 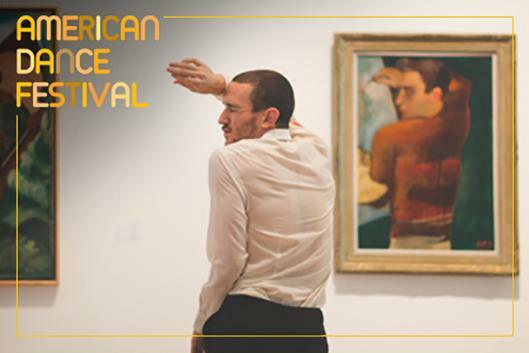 Ruttenberg seeks to create works that engage all the senses, not excluding the sense of humor, and to expand the existing audiences for dance. To that aim, she collaborates with artists from different fields (theater, film, music, and visual art) and examines new angles for the presentation and experience of dance. "Naba 2.0" invites audiences, through the use of audio guides, to choose their own soundtrack for the work which roams the galleries reacting to the presented artwork. "There was an exciting feeling of an underground experience less reminiscent of a visit to the museum and more like entering a desirable club after hours. There were beautiful moments in which the dancers brought the artworks to life, be it human, animal, or statue. It all felt alive. Ruttenberg is a witty and original choreographer"-Yedioth Ahronot.